Ankita Sridhar (right) worked with Jack Perkins (left) to study the different qualifiers for determining a patient’s risk for severe sepsis. Ankita Sridhar, a fourth-year student at the Virginia Tech Carilion School of Medicine, has laid the groundwork for a potential predictor of sepsis mortality. Sepsis is a medical emergency. It occurs when the body overacts to an infection. Without timely treatment, it can lead to tissue damage, organ failure, and death. Sepsis is unpredictable and can progress rapidly. It’s one of the leading causes of death in hospitals. The Centers for Medicare and Medicaid Services has six qualifiers used to label patients as “severe sepsis,” because they contribute to organ dysfunction and failure. Currently, each one is determined by a simple “yes” or “no” assessment. No matter how many of these qualifiers are present, patients are all diagnosed with severe sepsis. “This one-size-fits-all approach does not take into consideration the mortality difference based on the escalating number of qualifiers, nor does it delineate the importance of one qualifier compared to another,” Sridhar said. 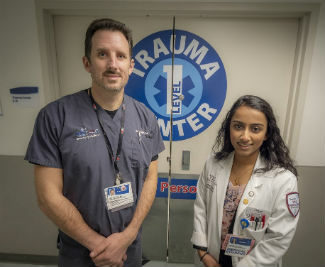 Working with her research mentor, John C. “Jack” Perkins, associate professor of emergency medicine at the school, Sridhar wanted to determine two things. First, was the presence of a greater number of organ dysfunction qualifiers a greater predictor of patient mortality? Her hypothesis was that having a greater number of qualifiers could be used as a means of decision making in the emergency department to determine a person’s risk for severe sepsis and the need for intervention. Second, is there one of those qualifiers that has the greatest predictability for mortality? Sridhar’s research method involved collecting and analyzing records from 519 sepsis-alert adults who came to Carilion Roanoke Memorial Hospital over a 12-month period. This involved looking at each patient’s chart to determine if they met the criteria to be included in the study. Sridhar led a team of four researchers to accomplish this task. Before this process could begin, she developed an algorithm that laid out step by step the process of going through each chart. After exclusion criteria were applied to the original 519 patients, 289 with severe sepsis were included in the study. Almost half of them had one organ dysfunction qualifier, and one patient had all six; the rest fell somewhere in between. “What we found was that cumulative organ dysfunction is a significant predictor of mortality, but interestingly enough, the type of dysfunction is not,” Sridhar said. Her data indicated that patients with three or more qualifiers had a significantly higher risk of death than patients with less than three, but it didn’t matter which three. After earning her undergraduate degree at the University of Virginia, Sridhar found herself excited about the prospect of attending the Virginia Tech Carilion School of Medicine, especially for its research program. The school is one of only a few in the country that requires students to undertake a four-year research project as part of its curriculum. Sridhar has presented at two national conferences and is in the process of preparing a manuscript for publication. The VTC School of Medicine’s student research continues to receive national attention. Since the school’s inception in 2010, students have produced over 80 academic publications and have given 39 oral presentations and 234 poster presentations at regional, national, and international meetings. After graduation in May, she will pursue a residency in family medicine. Having received a Letter of Distinction for her project, Sridhar will be one of eight students from the class of 2019 giving oral presentations as part of the VTCSOM Medical Student Research Symposium. In addition, the rest of the class will be giving poster presentations at the event, which will be held during the afternoon of March 8. The public is welcome to attend in person or tune into a livestream.